You can't afford to pass up such an amazing resource. Every week we stop by our local library to check out (borrow) books, movies and music. The kids love finding new adventures. Before visiting the library, search for parent books online and place a 'hold' on them. They will be ready to pick up at check-out so the kids don't get impatient browsing the grown-up section. Have a regular routine. Pick the same day each week (or every other week) to stop by. This way your books won't be late and your kids know "Tuesdays are library days". Sign up to get reminder emails when items are due. Remember to renew books online. Pick a short picture book to sit and read to your kids while you are there. Teach them about using their quiet voice. Give kids a tour of the library. Show them where the picture books are, the chapter books, the non-fiction books, the magazines, the movies, the music/book on CD. Then show them the reading spots and teach them proper behavior in the library. Set a number of books and videos to check out so you can keep track of them easier at home. We normally let our kids pick out 5 books and 2 movies each. Bring your own library bag. Keep your books in the bag at home or on a special shelf so you know where they are. You could let each kid have their own bag. Make getting a library card for your child a special event. As soon as your kids express a desire to have their own card you can let them get one. You can still keep track of the card. When our kids turned five (and can sign their own name) they are excited to get their own card. They love to do self-check out (with a little help) and learn that they are responsible for taking care of the items they check out. Attend storytimes or special events hosted at your library. Get to know your librarians and other families in your neighborhood. Ask about special children's events or services. I just recently found our library offers Literacy Kit bags. These are great for preschool kids. I got a bag about numbers and it had several books, a DVD, a music CD and some numbered bean bags. I could check it out for a month and use it for co-op preschool or just with my child. Find out if your library has a book sale and be sure to attend for great book bargins. Our city library hosts a huge book sale twice a year. We have found so many deals. 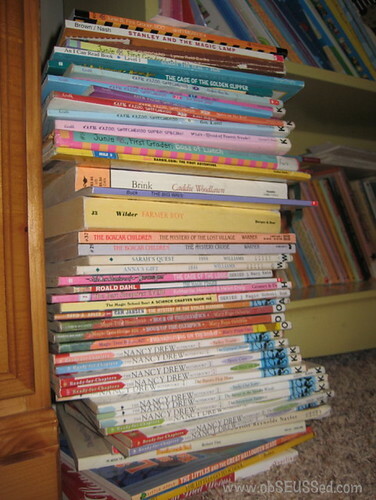 This is the stack of children's chapter books we bought at the last book sale they had. We got all these books for 50 cents each. CHECK IT OUT! 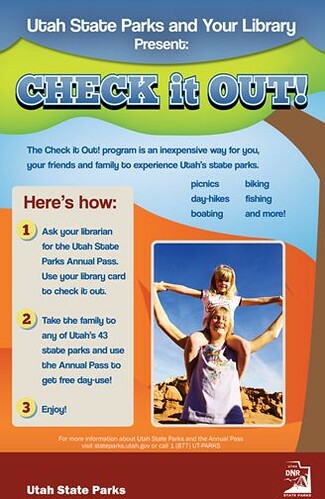 is an amazing program from Utah libraries and the Utah State Parks. You can actually check out an anual pass from your library to get in free to the state parks. See the Utah State Park Blog for more details. We are very fortunate to live within 10 minutes of three amazing libraries. 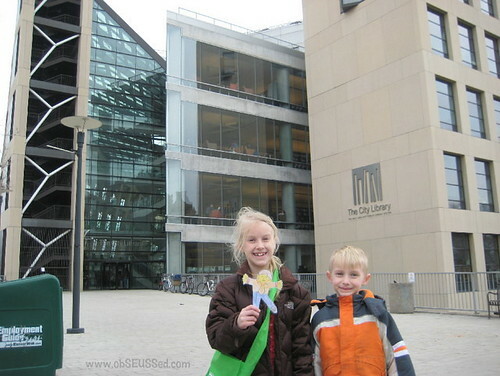 We visit our smaller libraries each week but every other month we head to the large Salt Lake City Library. The kids love their children's area with play forts, reading areas and a glass elevator. They also just got a new fancy website. Our entire city library system has an amazing kids' program. Marc Brown, the author of the popular children's book series "Arthur," will be visiting a local library later this month. They also have Dog Day afternoons where children can practice reading to dogs. They have a variety of storytime options and a variety of seasonal events. We love the Summer Book Program with prizes for tracking the books they've read. See their site for examples. 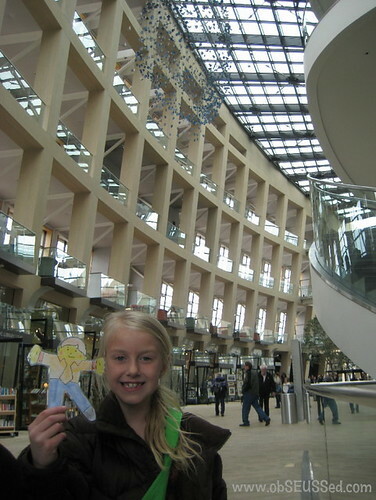 We recently took Flat Stanley to visit the library. What special things does your library do for children? Do you have any library tips? Great post!! We go to a small library, so my kids know the librarians well...it helps in picking out books! We also have a program where the kids read to therapy dogs once every couple of months...helps to train the dogs and with the children's reading!